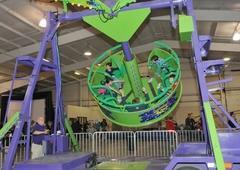 Eastern Shore Inflatables Wrecking Ball carnival ride will bring down the house! The wrecking ball carnival ride consist of an open seated platform suspended from a giant pendulum. Riders swing back and forth while spinning giving them an exciting ride that will meake their head spin... literally! Our most incredible carnival ride yet! 12 participants can ride at once. The ride starts slowly swinging back and forth and then the disc the riders are sitting on begins to spin as well! Great fun for ages 6 and up and we guarantee it will be one of the most popular attractions.